There’s wine. Stumbled on this pretty good Shiraz at Bottle Rocket Wine in NYC. Sure you can order it over the Web and likely you wont be disappointed. 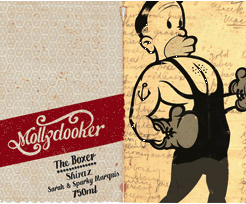 It’s a Mollydooker The Boxer Shiraz from South Australia. I try and get out once a week and do something that causes me to dig deep into the extensive inventory of gear I’ve accumulated — kayak, ski, hike, something. But some weeks leave little opportunity for a variety of reasons and/or excuses. This is one of those weeks. And in this case a good bottle of wine is gonna have to suffice as tops in terms of entertainment. Sure there is the superbowl, errr, Superbowl, but that’s just kinda rubbing it it — bunch a guys out doing what they love and we gotta watch it. Prefer to do as opposed to watch. In any case my Mollydooker is pretty good and it’s a 2008 — I hear the 2005 is pretty good as well. Without to much effort you should be able to find a bottle for something south of $25 — lemme know if you like it. Wine Spectator gave it a 91 for whatever that’s worth to you…pretty good. And yeah the label is…different…but the contents speak volumes. See you out there….next week (filed under Life Hacks). This entry was posted by John Pasmore on Sunday, February 7th, 2010 at 9:32 pm	and is filed under Life Hacks and tagged with Mollydooker, Shiraz. You can follow any responses to this entry through the RSS 2.0 feed. Thank you for your kind words in relation to The Boxer. It is a wine that certainly ‘packs a punch’ (excuse the pun). Sarah (Sparky’s wife) will certainly appreciate the feedback with regards to the label as well. All of our labels are rather quirky and different. Sarah and Sparky have recently been blending our 2009 vintage wines and let me tell you, they are looking amazing! Become a fan on Facebook http://www.facebook.com/MollydookerWines – may even have a video uploaded later today of Sarah and Sparky in the blending classroom.